Well, here’s a historic moment. Late in 2001, Narbonic started to take off, at least to the point that my very small site was going over its bandwidth allotment on a regular basis. At around the same time, I was contacted by Joey Manley, an opinionated Kentucky colonel living in the Bay Area. Joey was working for a dot-com startup but could see the crash coming, and, as he explained it to me, he’d decided to take advantage of his flush bank account and impending unemployment to do what he really wanted to do with his life. For reasons that remain a deep mystery to this day, what he wanted to do was run a webcomics site. I don’t know how Joey found me, but he came along at exactly the right moment. I needed free hosting for the burgeoning Narbonic archives, and I’d started to think that maybe it would be nice if I could find a way for my comic to make some money too. I’m still kinda working on that one. But the free hosting is nice. Relentlessly affable comics theorist Scott McCloud was an early supporter of Modern Tales, so I drew this strip in the style of his very useful book Understanding Comics. By this time Andrew and I were living together, and the badly-out-of-perspective drawing table in the first panel is his. Of particular note is the little posing mannequin painted and dressed up as Artemis Nightmare, the villain in a comic Andrew was working on at the time. I almost never draw at the drawing table, but I figured this would be simpler than drawing myself sitting crosslegged on my bed, drawing on a sheet of Plexiglass balanced on my portfolio. Man, the class of 2002…where are they now? Gene Yang’s American Born Chinese was eventually published in print by First Second and, in 2007, became the first graphic novel nominated for a National Book Award. Lark Pien has a book coming out soon from First Second too. Jim Zubkavich’s Makeshift Miracle was hugely popular during its online run and is now out as a graphic novel. Jesse Hamm drew the Minx graphic novel Good as Lily, written by Derek Kirk Kim (who almost joined MT and then dropped out, albeit not before talking me into it). Jason Shiga’s up for his second Eisner Award next weekend. Tom Hart, one of my longtime alt-comics heroes, became a friend, and we collaborated on our own webcomic, Trunktown. Lea Hernandez is another dear friend, and I swear we’re going to collaborate on something one of these days. Cat Garza is reentering the comics world after a hiatus, during which he got married and had a kid. John Barber now works as an editor for Marvel. 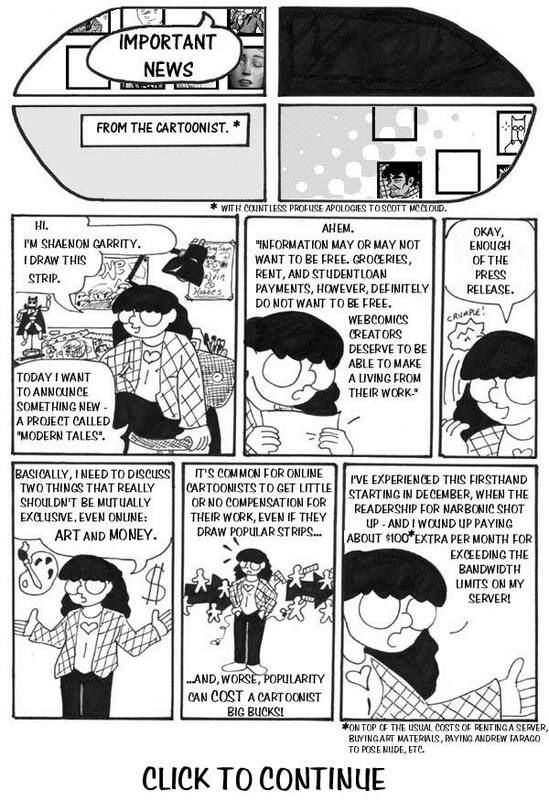 David Gaddis never ended up running anything on Modern Tales; as far as I know, he dropped out of comics not long after his one brilliant short webcomic, “Piercing,” and also moved away from the Bay Area so I don’t run into him at Shiga’s place anymore. Kent Dorfman became a sensitivity trainer for Encounter Groups of Cleveland, Inc., and Douglas C. Niedermeyer was killed in Vietnam by his own troops. The established webcartoonists in the launch lineup mostly used Modern Tales for side projects: Scott Kurtz ran his autobio strip, Wedlock, R Stevens did a Diesel Sweeties spinoff with a cute kid version of Clango, and Dorothy Gambrell drew The New Adventures of Death. Of the three, Dorothy’s strip was the only one that lasted long. Which was too bad, since during the time it ran, Wedlock was by far the most popular thing on Modern Tales. Of the launch comics, Bryant Paul Johnson’s Teaching Baby Paranoia, Chuck Whelon’s Pewfall, Tim Broderick’s Odd Jobs, and Dirk Tiede’s Paradigm Shift are all still updating regularly on Modern Tales. Some of the other creators who were around at launch, like Tom Hart and Lea Hernandez, moved to the sister sites Graphic Smash, Serializer, and Girlamatic when they started up. James Kochalka isn’t in my links here, but he was part of Modern Tales from early on and eventually launched a solo spinoff site, AmericanElf.com, which has spawned an entire genre of daily autobio webcomics. Joey recruited a lot of the launch cartoonists from several knots of cartooning friends in different parts of the country. I was then on the outskirts of the Bay Area circle that included Jason Shiga, Lark Pien, Gene Yang, David Gaddis, Jesse Hamm, and Chuck Whelon, so I guess that’s how he found me. I ended up becoming friends with a lot of the others online. That year, a lot of us, plus Joey, met up at the San Diego Comic-Con, the best Comic-Con I ever attended. Somewhere there’s a picture of us crowded on the steps of the convention center, ready to revolutionize comics. I don’t suppose we ever got around to doing that, but it was a beautiful weekend. First of all, I make an adorable boxer. Also of note: Mell is leaning on a strip that hasn’t run yet. Way to go with the spoilers, Shaenon of the past! So did I do the right thing by joining Modern Tales? I still don’t know. A lot of people have told me that I could’ve gotten a much bigger readership by keeping Narbonic free for the length of its run, and they’re probably right. On the other hand, all my comics are free now, and Skin Horse and these very Narbonic reruns have about the readership Narbonic had while it was behind the subscription wall. Maybe a little more. I suspect my comics are always going to appeal to a select audience, no matter how they’re presented. And Modern Tales has been good to me in other ways, mainly by giving me the chance to meet a lot of people I love very much, Joey Manley among them. He’s nothing but trouble, but I do love him. 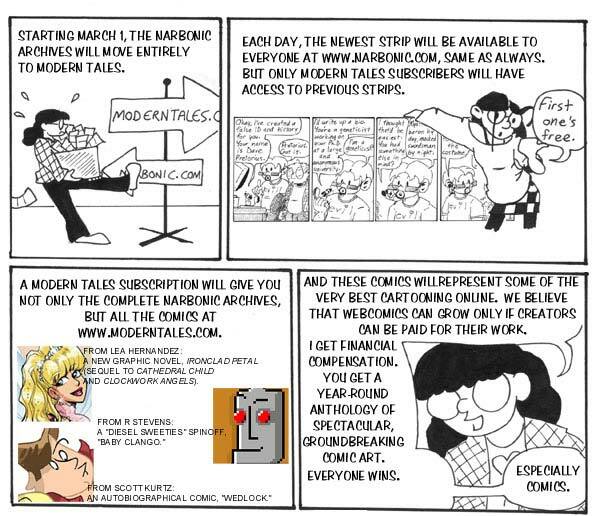 I took Narbonic off Modern Tales in its final months, but that is another story and shall be told another time. I’m now the content editor for MT, and while I’ve been in charge the subscription model has been phased out; it’s now effectively a free site supported (more or less) by advertising, which will have to do until we hit upon something better. Meanwhile, I’ve still got free hosting for my archives. Which was all I signed up for in the first place, so go figure. And, as you notice, it stops right in the middle of a very action-packed moment indeed. What a cruel barb of fate! I was deprived of narrative resolution, and with no hope of ever seeing the conclusion until I had purchased it (which, back then, was something I couldn’t do). Over those subsequent days I felt an unusual sense of frustration and loss, which in turn fermented my gradual, growing affection for the comic and its characters into a strong sense of longing. And so, several months later when I received my first credit card, my first purchase was a ten dollar subscription to MT, made with an addled, giddy heart. So there it is: if there was any one explanation for my inexplicable teenaged infatuation with this comic, then it is because it was behind a partially broken paywall. True story!